Food Blogga: Food Blogga is Julie & Julia's "Blog of the Day"
Food Blogga is Julie & Julia's "Blog of the Day"
A few years ago when I was at the bookstore, I picked up a copy of Julie Powell's memoir Julie and Julia: 365 Days, 524 Recipes, 1 Tiny Apartment. It was described as the story of a woman, who within the span of one year, cooked all 524 recipes in Julia Child's Mastering the Art of French Cooking, and then wrote a blog about it. I wanted to buy the book since I loved Julia Child, but I remember thinking to myself, "What the heck is a blog?" I bought it, and less than 48 hours later, had finished reading it. Powell writes with passion and wit. Whether or not you like her sharp tongue and irreverent humor, you can't deny that the girl is a talented writer. So I was pleasantly surprised when I heard that her book was being made into a film. Three years after reading Julie & Julia and tens of thousands of food blogs later, I was tickled to actually meet Julie at a promotional event in LA. Today I'm thrilled to announce that Food Blogga is "The Blog of the Day" on the official Julie & Julia movie web site. I am flattered to be among such esteemed company and to be associated with this delightful film. Since today marks the 367th post on Food Blogga, it's safe to say that I have gotten the hang of this blogging business. Thanks, Julie. Plus I now know how to make a mean boeuf bourguignon. Thanks, Julia. I saw on the website that they have featured blogs everyday. Congrats that you are one of them! I am so ridiculously excited for this movie. Like embarrassingly excited. I am more excited for this movie that I was for "Harry Potter" and that is a big deal. Yay, congratulations! I can't wait to see Meryl Streep as Julia. Um, COOL! Super jealous but very excited for you! So cool. And a well-deserved reward! Knowing that the movie isn't exactly like the book is pushing me toward watching it. (I loved the food part.) And of course I have to support Ms. Adams since she's an UNCSA alumna and once walked these same Winston-Salem streets! Congrats on being a featured blogger! You deserve it! Congrats! I love to watch this movie just for Meryl as julia. Congrats ! Congrats! I just love Meryl Streep. Very nice! Good job and congratulations! Can't wait to see the movie. Haven't read the book, but I'll go buy it per your recommendation. It's amazing how much Meryl Streep looks and acts like Julia. That's the power of a talented actress! Congrats Susan and I do hope the movie lives up to all the hype. 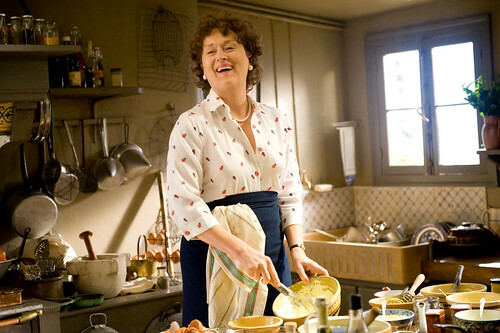 I saw a clip yesterday and Meryl Streep has imitated Julia Child perfectly. ann- She is really fabulous as Julia. saratogad-Thank you, kindly. That means a lot. Have fun with your friends! gffg-I loved the book, even though it's different from the movie. I hope you enjoy it too. What great posts about your meeting, the movie and all things romantic comedy! You rock! I can't wait to see The Streep. That is so exciting-my girls and I can't wait for the movie - definitely a girls night out! Congratulations, Susan. And you definitely have got the hang of "this blogging business". I saw the movie without even hearing of Julia Child before, since I am only 17 (I obviously never grew up watching the real thing.) It was so cute and hilarious. I had to watch the real Julia on youtube after, and I was so amazed by how well Meryl did hitting Julia's accent. I loved this movie so much, and I completely believe that Streep deserves some sort of nomination/award, she was amazing! i like your food so thank you so the food are so good. I saw the movie and bought the dvd I love the movie I can continuosly watch it without getting bored of it. I myself just graduated from culinary school and this movie definately became a great inspiration. I read the book and have to tell you how disappointed I was in the characters, the movie had a gentler side to the character of Julie and the book was definately much more crude compared to the movie. I don't think I'm too fond of the actual Julie, but the movie was great nevertheless.